You are invited to visit a BNI Northern Indiana chapter meeting or contact one of our professional Director Consultants or Ambassadors to discover how you can grow your business as a member of BNI. You may contact the BNI Northern Indiana office by calling (574) 535-3310, sending email or by selecting the "Send Message" link. Send a message to BNI Northern Indiana next to each name below. 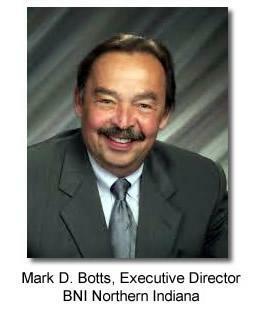 One of the BNI Northern Indiana director consultants will contact you as soon as possible. If you would like to speak to us about growing your business, or if you would like to know how to start your own chapter contact Mark Botts, Executive Director BNI Northern Indiana by calling (574) 535-3310 or send an email.